Certified Lawyers on Call (CLOC) is a program designed for Certified lawyers to provide pro bono assistance to legal aid staff lawyers and pro bono lawyers. 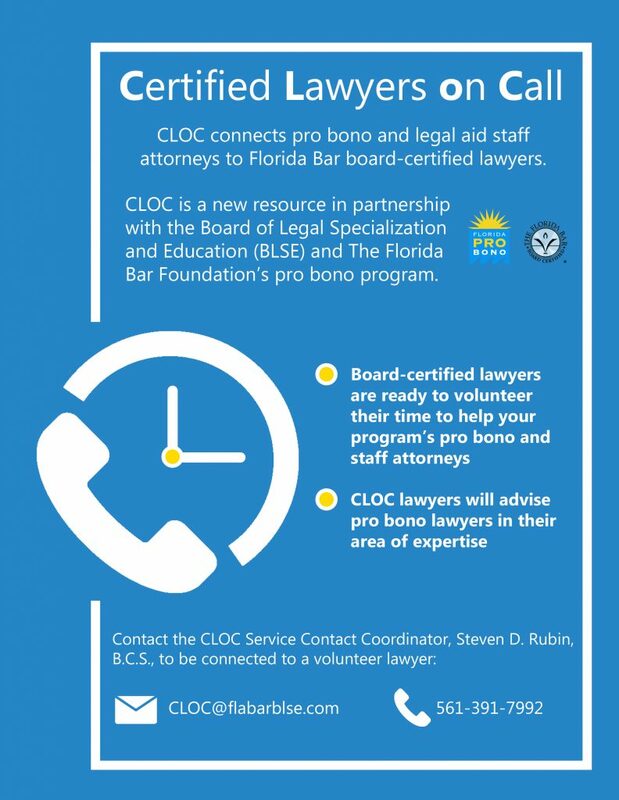 CLOC is a new resource in partnership with the Board of Legal Specialization and Education (BLSE) and The Florida Bar Foundation’s pro bono program. 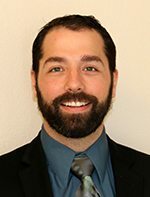 – Staff Attorney, Bay Area Legal Services, Inc. The requesting legal aid staff attorney or legal aid referral attorney will identify a legal issue for which advice is needed. The requesting attorney will then contact the CLOC Service Coordinator by e-mail at CLOC@flabarblse.com. The requesting attorney must sign the CLOC Acknowledgment and Limitation Form and return it by e-mail to the CLOC Service Coordinator. The CLOC Service Coordinator will then determine the specific area of Board Certification the legal issue pertains to. The coordinator may contact the requesting attorney by telephone for any necessary clarification. After the practice area of Board Certification is determined, the CLOC Service Coordinator will match the requesting attorney with a Board Certified Lawyer who has volunteered as an advisor. The coordinator will select, on a random and rotating basis, a Board Certified Lawyer from the list of volunteer advisors maintained by the BLSE. The coordinator will notify the selected Board Certified Lawyer advisor by electronic mail or telephone of the inquiry, provide the requesting lawyer with the Board Certified Lawyer’s contact information, and provide the Board Certified Lawyer with the requesting lawyer’s contact information. The requesting lawyer will have the initial responsibility to contact the Board Certified Lawyer by telephone or e-mail. Prior to discussing the specifics of any issue, the Board Certified Lawyer advisor must perform a conflicts check. The requesting attorney must identify all known adverse parties and opposing counsel and provide this information to the Board Certified Lawyer advisor in the initial contact with the advisor. If an actual or potential conflict exists, the Board Certified Lawyer shall advise the requesting attorney that the adviser cannot assist due to a conflict, and the requesting attorney will then notify the CLOC Service Coordinator that the selected advisor is unable to provide assistance. The coordinator will select an alternate advisor from the list, and the contact process will be repeated. If no actual or potential conflict exists, the requesting lawyer will describe the legal issue(s) to the Board Certified Lawyer advisor in detail, and the Board Certified Lawyer advisor will provide assistance. After a brief discussion with the Board Certified Lawyer advisor, the requesting lawyer should exercise the lawyer’s own independent judgment to resolve the legal issue for the client. It is within the discretion of the Board Certified Lawyer to offer more or continuing assistance to the requesting lawyer with respect to the legal issues raised.